This evening, after yoga, I stayed and talked with a few people and learned a new expression I'd never heard before. A man was describing a recent trip to Costa Rica and how he'd gone down there for two reasons: a yoga retreat and a clinical study. A twofer. "I figured I'd feed two birds with the same seed," he said. It's obviously a take on the classic English saying kill two birds with one stone, but with a kinder, more pacifist-leaning take. I made a mental note to try and internalize it and use it going forward. 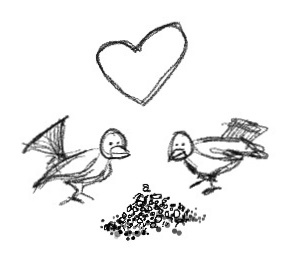 Feed two birds with one seed. It was regional at that time; I'm not sure if it's spread. Ha! So maybe it is a phrase I've managed to miss-out on, but only because I happen to have grown-up in the right part of the world where it might be heard.